Arizona’s Flotsam and Jetsam are firmly entrenched in the ‘should-have-been-massive’ file. Their seminal 1986 debut Doomsday for the Deceiver was a game changer and its follow up No Place for Disgrace solidified their standing in the thrash world. The aptly titled When the Storm Comes Down saw the group continue on an upward trajectory however when the storm did hit in the shape of grunge the whole musical landscape changed. Unlike some of their peers Flotsam and Jetsam never jumped ship but the market for adrenaline-infused thrash shrunk significantly and in truth the turmoil in the music industry did knock the band off their stride. 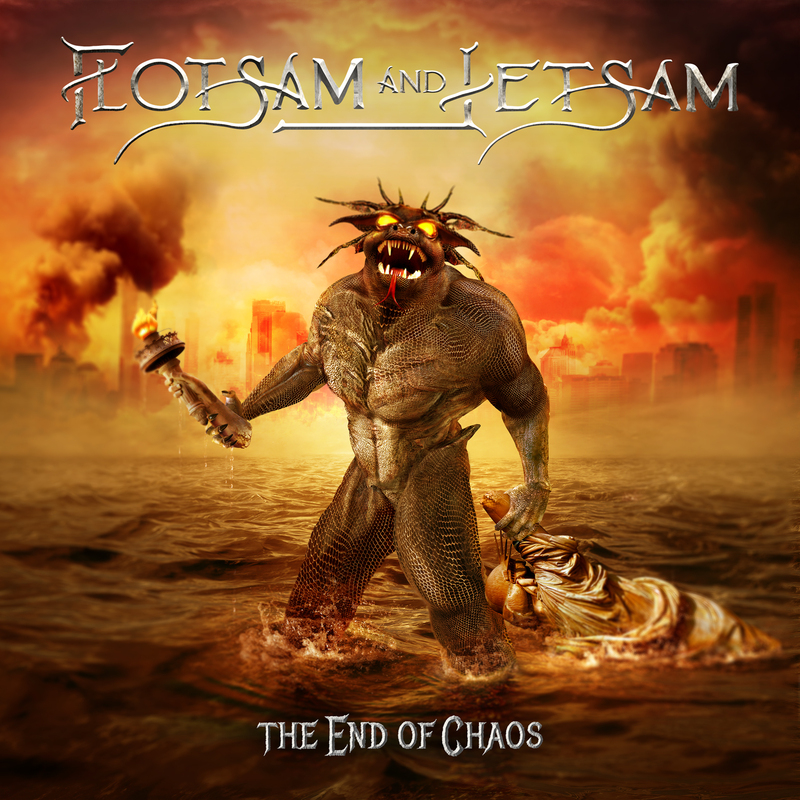 After a mid-career wobble Flotsam and Jetsam made a stunning return to form with their critically acclaimed 2016 eponymous opus which easily rivalled their early efforts. It found the band at their pinnacle and like many self-titled albums it proved to be something of a rebirth. The End of Chaos continues very much in that spirit but fans shouldn’t worry as the band haven’t tampered with their formula too much. It’s the same Flotsam and Jetsam only more streamlined: gone are the acoustic interludes and epic songs (only two tracks barely break the five minute mark) and the resulting album benefits immensely. Subsequently The End of Chaos sounds more direct and muscular and it finds Flotsam rejuvenated and playing with a renewed hunger. With the briefest of intros album opener ‘Prisoner of Time’ races out of the blocks and it’s the perfect statement of intent. Thundering drums, some fine shredding and a meaty riff create a perfect maelstrom before the song settles into a rather tasty thrash/power metal hybrid and it’s a foot-on-the-monitor, pedal-to-the-metal thrasher of the finest order. Next track and latest single ‘Control’ ups the ante with new drummer Ken Mary (Fifth Angel, Alice Cooper) putting his stamp on proceedings and his busy style, with lots of rolls and fills, really powers the song. In the blistering ‘Recover’ we can hear Flotsam’s unquestionable influence on bands like Blind Guardian and Gama Bomb who carry the flame that Flotsam and Jetsam ignited many moons ago. Still led by irrepressible vocalist Eric “A.K.” Knutson along with original guitarist Michael Gilbert and with long term bassist Michael Spencer back in the fold it’s obvious Flotsam and Jetsam share a real chemistry that borders on telepathy. Throughout the album the band are tight as a beating drum and the pace never lets up. Each track is delivered like an adrenaline charged warhead and while some might bemoan the lack of variety there’s plenty of neat time changes to keep things interesting. From the groove laden ‘Demolition Man’ to the addictive hook of ‘Architects of Hate’ the album has a unified feel and hangs together as a whole primarily due to Jacob Hansen’s even handed production. While I do miss the rough edge of Doomsday there’s no denying that the sheen applied here enhances the bands aggression and The End of Chaos approaches the listener like a runaway juggernaut. ‘Slowly Insane’ features some excellent guitar dualling between Michael Spencer and Steve Conley very much in the tradition of Iron Maiden and Judas Priest only faster and stamped with their own inimitable style. “I bet you didn’t see that one coming, Right between the eyes” Knutson sings on ‘Unwelcome Surprise’. And certainly many will be astonished that The End of Chaos is played with such a youthful exuberance by a band who are well into their third decade. The lyrics throughout this album veer between realism and fantasy and the former work very well, especially on the tale of nuclear armageddon ‘Survive’. However on ‘Prepare For Chaos’ the capricious lyrics sound a tad forced. Flotsam and Jetsam always had a gritty, street-level quality so those tracks which deal with life’s tribulations carry far more weight. ‘The End’ closes this twelve track thrasher in suitably frantic fashion, it’s the sound of a band battle scarred but unbeaten with a middle finger raised to the fickle music industry. Why Flotsam and Jetsam never entered metal’s top tier shall remain a mystery but it has allowed them to operate with a degree of autonomy and produce consistently good work without pandering to fads and trends. And on the evidence of The End of Chaos this is just the beginning.